Our 540512 All 316L Stainless Steel Mercury header is basically the same as our 540505 All 316L Stainless Steel Mercury header except for the overall width, which is 33". Designed with a narrow overall width for tight motor box configurations or for twin engines applications. A short or angled valve cover must be used. This header must removed to adjust valves. 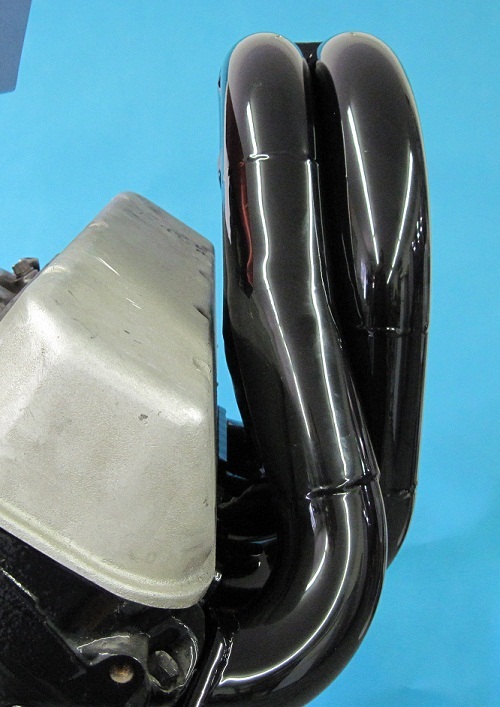 This Low Port fresh water header incorporates a 2" primary tube (1 7/8" I.D.) This header will adequately handle engines up to 572 cubic inches. This Header usually replaces Merc exhaust where their is a "S" bend or 2 90deg elbows after the manifold. The Header can also be used for other boats where the engine is very close to the transom and the exhaust port height is near crankshaft centerline. The header points down 75 to 90 degrees. This Header usually exits below the water line so reversion should be considered. Keep in mind, when exhaust tips are below the water line, the header can literally pull water up from outside the boat.